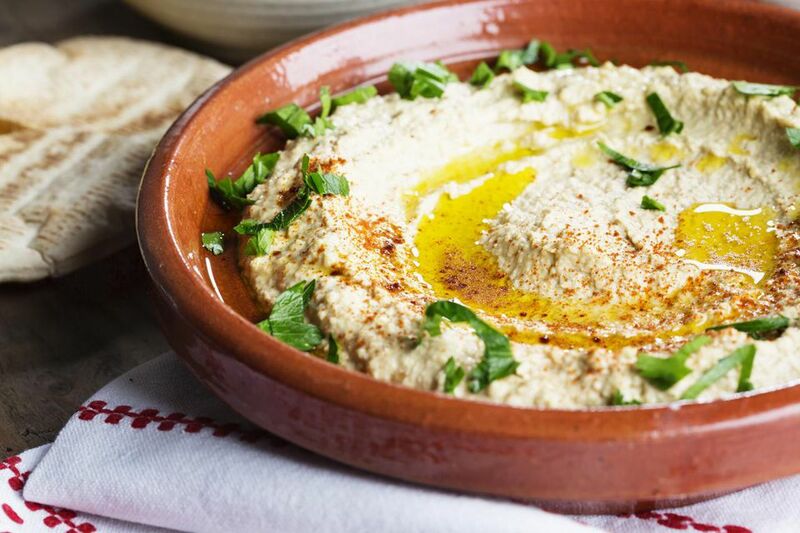 Hummus is one of the easiest Middle Eastern food to prepare, and it's so simple that even most children can prepare hummus on their own. And while most people use a food processor to make hummus at home because it's quick, easy and convenient, what do you do if you don't own one? The good news is that you aren't out of luck. The fact is that a lot of kitchens aren't equipped with a food processor in the Middle East although hummus is prepared and eaten there every day. In fact, when you stop to think about it, hummus was prepared and consumed in ancient Egypt long before the standard food processor had even been invented! So, tiny kitchen and college dorm dwellers, don't fret. Using a food processor does result in a creamier mix, but without one, you'll have a thicker, chunkier hummus that will still be bursting with flavor. This is just a basic hummus recipe. The great thing about hummus is that it is so versatile. You can add in a wide variety of spices or vegetables and it will only add to the flavor. Start with a good base and add what you like! A blender is going to be the next best thing to a food processor. Put all ingredients in a blender and blend. Just remember to put in your thicker ingredients first, like the chickpeas and tahini. Otherwise, your blender, unless you have a commercial grade version, might have trouble thoroughly blending everything. Using a mortar and pestle is the "old school" way of making hummus, but works. Just be prepared to put a little elbow grease into it! For those unfamiliar, a mortar and pestle are two bowls (mortar) and bat (pestle) shaped objects used to pulverize foods, such as seeds, herbs, and spice. Yes, you can microwave your hummus. Microwaving makes chickpeas easier to mash with a fork. Before mixing the ingredients, place the chickpeas in a microwave-safe bowl and heat them for about 30 seconds. Drain, but keep the liquid because you may need it in case your hummus is too thick. After mashing, add the tahini and all the remaining ingredients. If it's still too thick, add one tablespoon of the drained chickpea liquid at a time until you've got the consistency you like. If all else fails, you can always buy a basic hummus at the grocery store and add the spices and vegetables you want. Popular hummus recipes include garlic, jalapeno peppers, and sundried tomatoes. But first, try making your own because you'll definitely taste the freshness.